Home » News » Going out with a splash! Tuesday 23rd October saw the Macmillan Prevention and Re-enablement project hold its final Wellbeing Day of 2018 at the Bristol Aquarium. 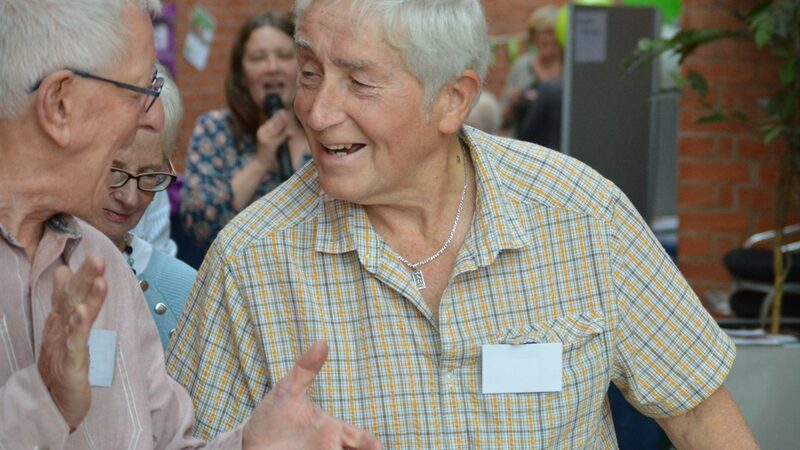 This was the third Macmillan Wellbeing Day of the year that focused on supporting people aged 55+ who are living with beyond cancer to get active, as well as informing them of the activities and services available across Central and East Bristol. For the 37 people attending, the aims of the day were outlined in the opening talk; to meet new people, become informed of support services available, to inspire action after the event, and most importantly, for them to have fun. The numerous benefits of physical activity were also echoed throughout the event, as this is a positive part of cancer pre-treatment, post-treatment, and beyond into recovery. Offered in a safe and supportive environment, the first of the activity taster sessions of the day began with participants limbering up to a Chair-based Gentle Exercise session, ran by instructor Athina from Wellspring Healthy Living Centre. Rosie Sadler, Physical Activity Coordinator and Wellbeing Practitioner at Wellspring, was also present on the day to offer ‘goal setting’ support for participants. A lively Line Dancing session followed with participants performing some fancy footwork to some lively tunes with instructor Christine Power who runs numerous Line Dancing sessions across Bristol, including The Beehive Centre in Whitehall. With smiles all round, participants tested their foot coordination and worked up an appetite for lunch. Forty African drums and hand percussion instruments were available for the African Drumming session that followed lunch. Instructor Richard from World Jungle, led a simple rhythm for everyone to follow during this 20-minute taster session and soon enough infectious smiles and laughter filled the room alongside the rhythmic sounds. The session provided a fun and vibrant backdrop to the day that gave a snippet of what Richards regular session at the Malcolm X Centre would entail. Finishing the day was a Sound Bath by the Bards of Avalon, which gave the event a special note to end on. Using a range of percussion instruments and their own voices, Bea and David created a session of transformative sound to relax participants in stillness and harmony. Many participants commented on how relaxed and tranquil they felt. A big thank you to all of the stallholders showcasing their fantastic services on the day including The Carers Support Centre; Community Access Support Service; Penny Brohn UK; HealthWatch Bristol; LiveWest; and ACE Neighbours and to our Complementary Therapists Marion and Helena who treated many participants to a massage. In the month following this Macmillan Wellbeing Day, 53% of participants surveyed have since taken up activity, and 27% are planning to take up activity soon. If you are aged 55+, are living with and beyond cancer, a carer or support, and would like to find out more about the project, please contact our Macmillan Prevention and Re-enablement team on 0117 353 3042. Did you attend one of our Macmillan Wellbeing Days this year? If so, we would love to hear from you!